Crap & Couture: I Love My Work! In preparing my musings, my staff and I gather tons of pictures, most of them shot by the awesome M. McKenzie. M. took time off her vacation to get this photo and send it to me. It is the most truly fantastic non-clothing based Crap and Couture photo in the history of Crap and Couture. 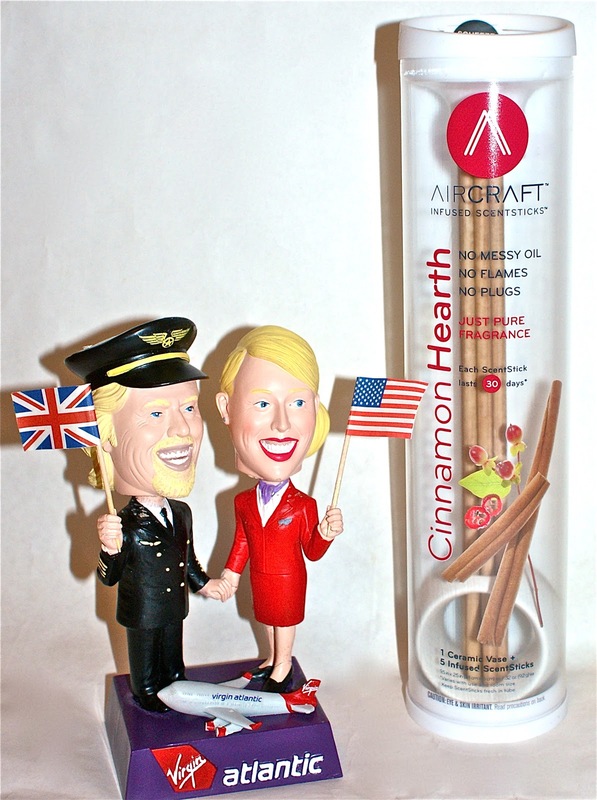 The new, and oh so yummy, Scentsticks combined with the dual flag-waving bobble-heads of a gap-smiling Richard Branson and a 1,000-yard staring flight attendant holding hands while a tiny un-airworthy 747 scuttles across their feet combined to truly make me appreciate the spirit of human ingenuity. M. McKenzie did not just capture the image of a great product and a cute toy, she documented the bright future of all mankind!! !